A few months ago, I asked my baby sister what cake she wanted for her birthday. 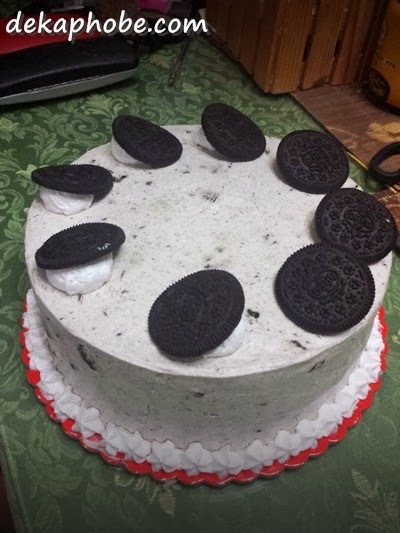 Knowing her love for anything cookies and cream, she asked for an Oreo cake. However, she doesn't like cheesecake, just a cream cake. It got me thinking where I could find one (aside from Red Ribbon, of course). 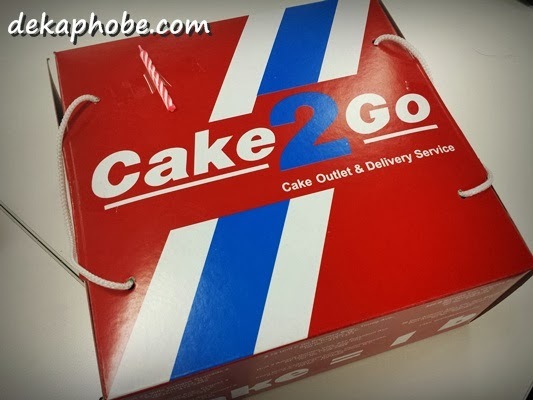 The search led me to Cake2Go, a cake delivery service which has been there for quite a long time. 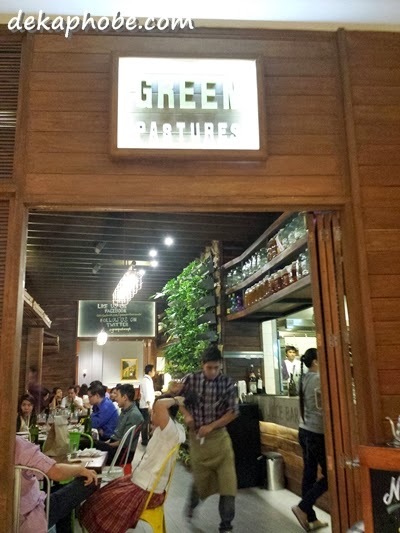 Green Pastures, the newest baby of Chef Robby Goco (of Cyma fame), opened last August 2013. It offers dishes made from local organic ingredients. Since it opened, the place has alwasys been full, so expect to wait in line for great food. That was the case for both my visits last week. During my two visits, I have noticed that some of the bestselling dishes are not always available. During the first visit, some of us (myself included) got the Organic Melon Green Tea (Php 100 per glass, Php 155 refillable) while some had Hibiscus Iced Tea (Php 90 per glass, Php 135 refillable). I have returned to Kapitolyo to try this new Asian fusion restaurant in the area called Ninak. 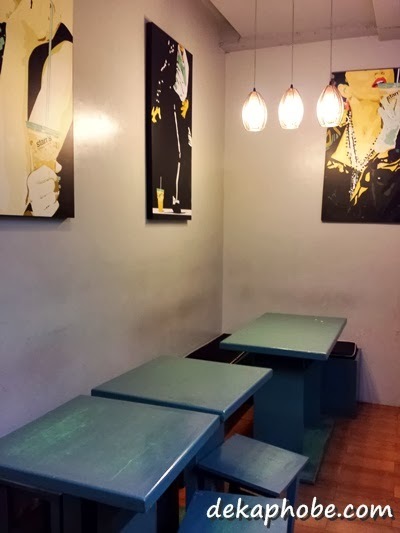 Ninak (or 'kanin' spelled backwards), is the newest venture of the people behind Brothers Burger (yes, that awesome burger place.) Ninak was actually mentioned by them during the Brothers Burger event I went to a few months before Ninak opened. As we wait for our orders, we were served the complimentary bread with olive oil dip. 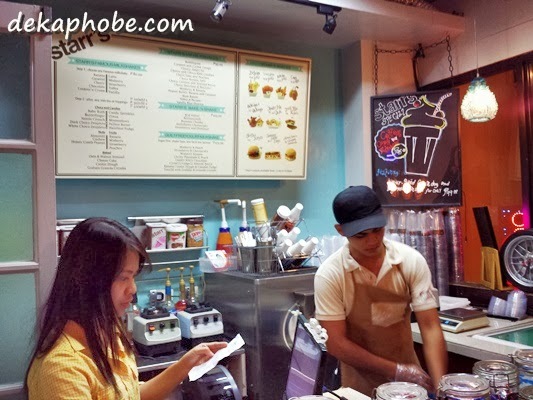 I had Ginger Watermelon smoothie (Php 140) while my friend got Bottomless Iced Tea (Php 110). Though I always order watermelon smoothie whenever available, it's my first time to try it blended with ginger. It was very refreshing with a nice kick from the ginger. I spent one weekend with my younger siblings in Club Manila East, Taytay, Rizal. Though the place is only a few minutes away from our home, I haven't been there before. Club Manila East, opened in 1999, is a one-stop resort located in Rizal with amenities not only for swimming but also for surfing, zipline, beach volleyball, and even kayaking. Club Manila East is also the perfect venue for events like parties and other activities like seminars, team-building and conferences. As soon as we arrived, we were brought to our Cabana. Our cabana has its own tables, chair, mini kitchen counter, fan, toilet and shower room. It can accommodate 10-15 persons. This 100% child-friendly pool includes a kiddie slide, fountains and waterfalls. Project Pie: Create Your Own Pizza! My friends and I had a mini-reunion / Christmas dinner at one of the newest pizza places, Project Pie. I have been curious about this place since it opened around July last year. Project Pie is an American concept brand with locations in California and Las Vegas. In fact, Philippines is the first location outside the US. In a span of less than year, Project Pie has already three locations in Manila: Shaw Blvd, Blue Bay Macapagal and Alabang. We went to the first location in Shaw Boulevard. It is a self-service restaurant so it can get chaotic especially during peak hours. It's best to reserve seats before lining up to order. Build Your Own Pizzas are priced at Php 285. If you aren't into customizing your pizzas, there are 6 pre-set flavors for Php 285 (Numbers 2-7) or you can just go with a Classic Cheese Pie for Php 245. Tokyo's popular 25-layer tonkatsu is now in Manila! Kimukatsu, a famous pork cutlet restaurant in Japan with locations in Tokyo, Osaka, Yokohama and Sendai within Japan and international locations in the USA and Korea, has opened its first Philippine location last December 22, 2013 in Shangri-la Plaza East Wing. It was rather fortunate that I was invited by the people behind Kimukatsu to try their dishes. I love that the cabbage and miso soup (red or white) was served immediately, so the customers can start eating while waiting for the katsu to be served. The cabbage is unlimited, and can be mixed with either goma or shio dressing. It was also interesting that they have two kinds of miso soup: red, a bit of spicy kick added, and white, which is soothing and creamy. I'm a huge fan of breakfast, and it follows that I love pan de sal and all things you can eat or drink with pan de sal. That's why I love Pan de Manila. I'm crazy about their Cheese Pesto, Cheese Pan de Sal, and the Classic Pan de Sal with Pan de Manila Garlic Butter Spread or Peanut Butter. I'm also in love with their Cafe con Leche, Chocolate con Leche and Chocolate Blanco. Pan de Manila is indeed every breakfast lover's heaven. I was invited by the good guys behind Pan de Manila to try their newest product: the Pan de Donut! Pan de Donut is a combination of pan de sal and doughnuts. A surprisingly healthy alternative to heavily oily and sugar doughnuts, Pan de Donuts are not only baked, it is also bromate-free and trans-fat free. Tokyo Tokyo is a casual restaurant that has been serving delicious and affordable Japanese food for years. All through out the years, Tokyo Tokyo never fails to introduce something new. One of their newest offerings is the Tokyo Tokyo Ramen. They currently have three flavors available in two sizes: snack size (Php 99) and regular size (Php 150). Each ramen bowl has tonkotsu broth simmered for 24 hours, firm noodles and fresh toppings. The Braised Pork Ramen is topped with tender braised pork slices, the Spicy Chicken Ramen has chicken chunks while Tempura Miso Ramen (my favorite) is topped with prawn tempura and miso. You may also have gyoza and red iced tea with your ramen for Php 150 for snack size and Php 200 for regular size. My friend Lovelee and I had our post-Christmas dinner at this newly-opened restaurant named Ombu Modern Filipino. 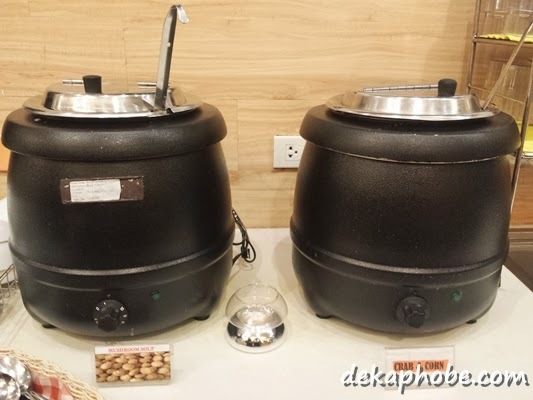 It is located at the ground floor of one of the newest hotels in the area, Sequioa Hotel. Ironic for a Filipino restaurant, Ombu's interiors are neat, with mostly white and black accents to the tables, chairs and walls. We practically have the place to ourselves, so we chose to sit at the booth. Our world needs more humor. In a world where everything seems to be gloomy and sad, I believe than anyone who creates laughter is a hero. An addition to my league of heroes is my fellow blogger and PBOer, Glenn of Wickedmouth. Late last year, Glenn (alongside one of my favorite bloggers, Motsmots) published his first book "Unang Putok". Though I am trying to get healthy, there is one thing that can ruin my attempt: milkshakes. 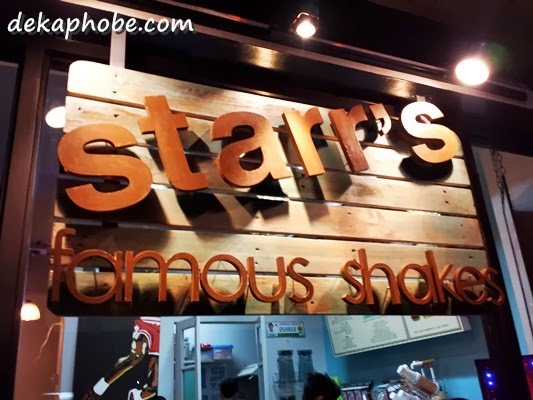 After our dinner at Brickfire, I was convinced by my friend to try some milkshakes downstairs at Starr's Famous Shakes. We were quite lucky that the place was almost empty when we arrived. I was happy to see that they also offer Guilt-Free Yogurt Milkshakes aside from Starr's VIP milkshakes, but unfortunately the froyo machine wasn't working that time. A new restaurant has opened near our workplace late last year: KXP or Kulinarya Experience. 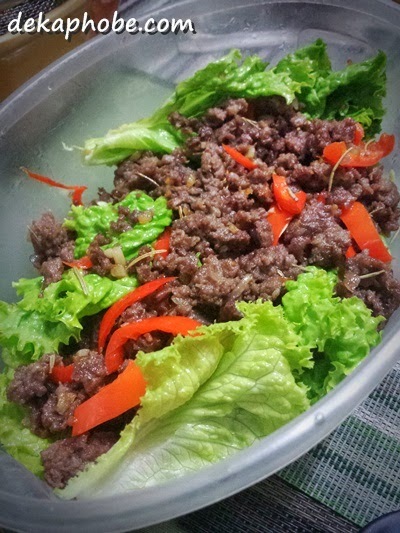 KXP is a concept restaurant of Kulinarya Kitchen in Rockwell to offer gourmet food at reasonable prices. 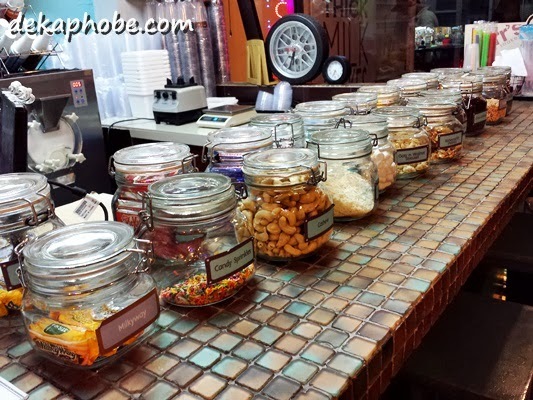 I have visited the place for several times and I always come back to try more of what they have to offer. Some of their pasta dishes have solo and for sharing servings. We have tried the Mac & Cheese (Php 170), Carbonara (Php 100 for solo, Php 250 for sharing), Basil Pesto (Php 125 for solo, Php 310 for sharing) and Tuyo with Capers Spaghetti (Php 130 for solo, Php 320 for sharing). 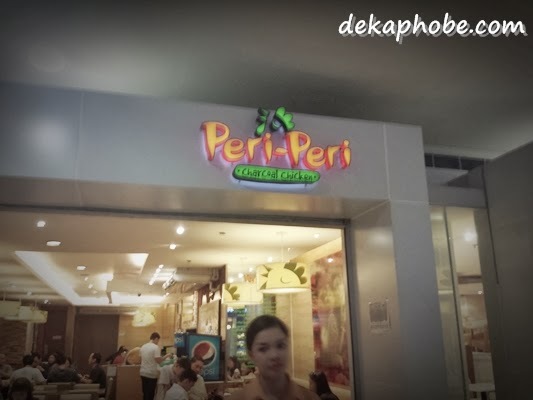 The girls and I went to mall during lunch break to check out stores on sale, but before that, we had to fill our empty tummies at Peri-Peri. Peri-Peri Chicken is a Portuguese style of grilled chicken. Upon researching, the word Peri-Peri comes from the African Bird's Eye Chili or Piri Piri, one of the spices used for Peri-Peri Chicken. For our group, we ordered a Full Fiesta Platter (Php 688), which is good for 4 persons. It has 8 pieces Peri Chicken, large Java rice, 2 coleslaw and 2 corn & carrots. We also availabled their Soup and Beverage all you want for Php 49 per person. 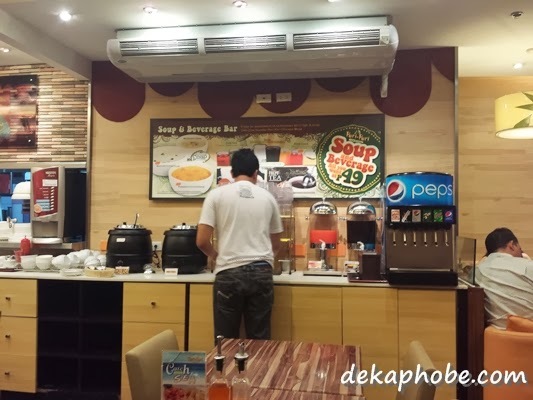 The soup and beverage bar is self-service, so you can get all the drinks and soups you want. There are 2 soups available during our visit: Mushroom Soup and Crab & Corn. Available drinks are sodas and juices. The Nescafe machine wasn't working that time, too bad because I'd love to have some iced coffee.